MB1 - Earthquake Sound Corp. Most factory stereos, even high-end systems, protect speakers by reducing subharmonic output when the volume is high. That's OK in a regular system, but this bottle neck system will handicap low-frequency performance if you want to upgrade your factory stereo with amplifiers and subwoofers. The Earthquake MB1 detects the input level from a factory stereo, then adds more bass at high volume levels while keeping your bass response balanced at low volume. Now you can keep your factory stereo looking flush and its steering wheel controls intact while actually improving the bass quality and depth. The MB1 wires up to any system easily, and can be mounted in the front or rear of the vehicle. It has two gold plated inputs and outputs plus it has a remote dash control for easy adjustments. 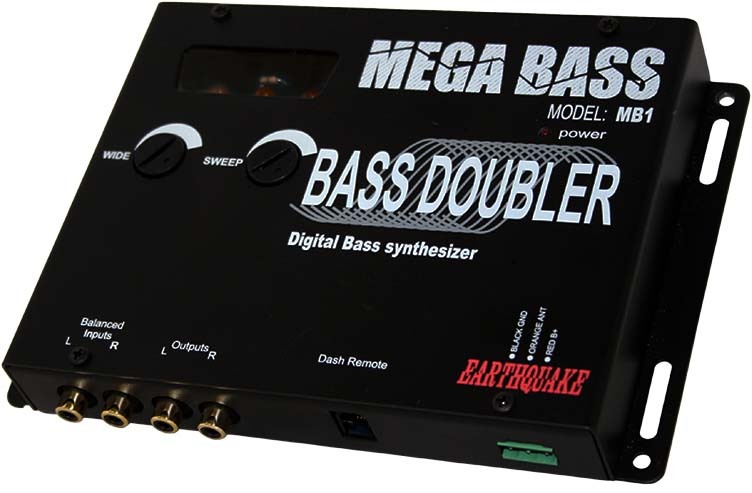 The SWEEP and WIDE controls manage frequency ranges for extremely high precision custom built bass response.